There are basically two models of the Casio micro-mini calculator; the M800, a basic 4-function version, and the M810, a version with % and memory functions too. To confuse matters, the M800 appears with several casing finishes and also with either a yellow-filtered LCD or clear-LCD. Mottled-golden finish Casio micro-mini M800 with yellow-filtered LCD. 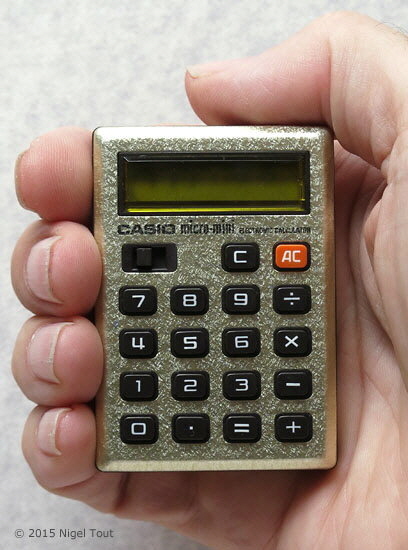 Distinctive features: Tiny "matchbox" size calculator. Display is 8 digits, LCD, either yellow-filtered or clear. Battery: 1.2v (one button cell), with claimed running time of 60 hours. Size: 43 x 62 x 14mm. (1.7" x 2.4" x 0.6"). Cost: November 1976 US$29.95 [about £16 GBP]. The Casio micro-mini M800 was available in several casing finishes and, probably a later version, with clear LCD instead of the yellow-filtered version (to cut out wavelengths of light harmful to the LCD). 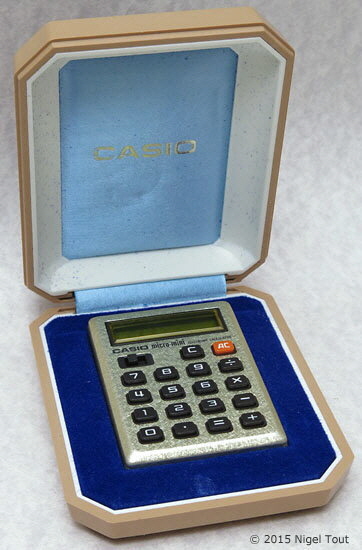 Casio micro-mini M800 in its presentation case. 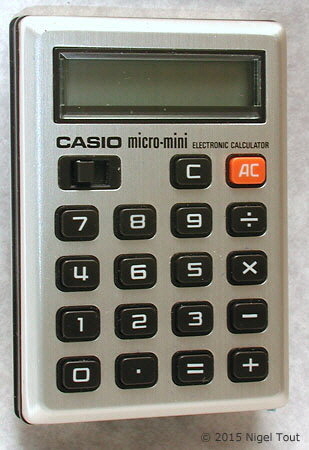 Clear-LCD version of the Casio micro-mini M800. Colour brochure for the Casio micro-mini M800. 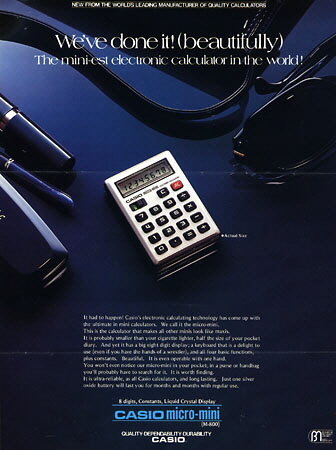 "The mini-est electronic calculator in the world." Display is 8 digits, yellow-filtered LCD (to cut out wavelengths of light harmful to the LCD). Battery: 1.2v (one button cell). 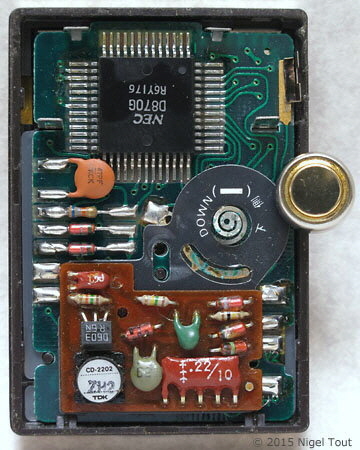 The circuit board inside the Casio micro-mini M810 together with a button cell of the type that it uses. At the top is the NEC D870G calculator integrated circuit in a "Quad Flat Package". The black circle on the right is insulation where the button cell sits, and the small circuit board is likely to be an oscillator to provide a higher voltage than the 1.2v from the button cell. 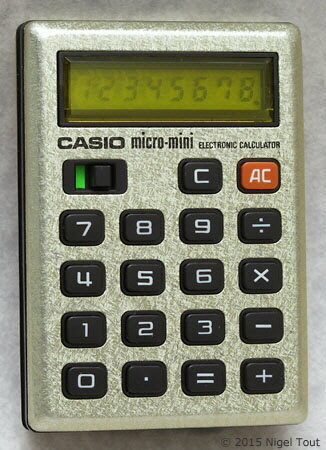 Using a low-power LCD display allowed the calculator to be powered by a single button cell. The single chip is in a "Quad Flat Package" which has a small footprint and allows the use of the tiny case. The introduction of "Matchbox" size calculators was, however, a dead end in calculator development. They are tiny, and easy to misplace, but still a bit on the thick. 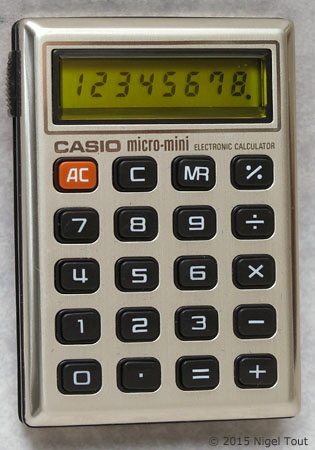 The direction in which calculator development took off around this time was with the "Credit card" size calculator, such as the Casio Mini Card LC-78. These, being thin but having an easily manageable form-factor, became very popular in a large variety of models. "Micro Calculator", Popular Science, November 1976, p100.